The motor pool is chosen to take part in an army training film on spark plugs, with Doberman playing Private All-thumbs. During a break Bilko takes the chance to make his own training film, 'What Every Young Spark Plug Should Know', with WAC's dancing. And the Pentagon loves it!! Ernie looks around for somebody to go on the TV quiz show The $64,000 Question. He then finds out that Corporal Ed Honnegar, whilst snowbound in the Arctic, memorised a whole 'everything you need to know about birds' book. Honnegar goes on the show and he is doing brilliantly. Up to $32,000 easily and then he accidently hits his head and all the birds fly out of his head! 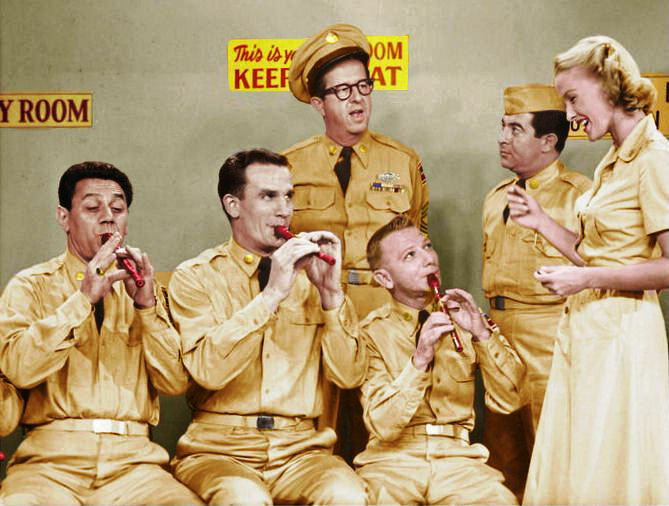 Bilko and his platoon are sent to Schmill College to teach the ROTC students transport maintenance. Whilst there, Bilko finds out that Millionaire's son Justin Pearce Junior owes local gangster, Big Ed Macmillan, $1000. Ernie says he'll teach the gangster a lesson for him. He puts $100 on Schmill football team to beat Notre Dame in the season's opener at odds of 1000-1. Even though in the last 12 years Schmill have never scored against Notre Dame and over 100 points have been scored against Schmill in all of the matches. Although he knows he has no chance Ernie organises a publicity campaign that has Big Ed quaking in his boots. So nervous he even tries to buy back his bet. In New York, Bilko helps Barbella out with a family crisis: Rocco's brother, Angie, has had an arranged marriage prepared for him but he doesn't want to marry the 'peasant' girl that he is supposed to wed. Bilko uses a strategy from the hit musical My Fair Lady to make her glamorous to get Angie jealous. The thing is Ernie now wants Rosa too!! Special Services turn up at Fort Baxter and start classes on art and dance and Bilko's platoon sign up!! The reason? The classes are run by two lovely ladies!! Bilko becomes desperate to get his men back gambling with him - so he arranges some gambling 'tie-ins' with the classes. About to say goodbye to the army, Sergeant Rupert Ritzik avoids Bilko in case he loses his $400 nest egg to him. Ernie is aghast, so much so that he raises $400 for the Ritzik's to put towards their nest egg. But Rupert won't accept it as he fears he's trying to con him. Bilko then tries to give the money to Rupert by betting on ridiculous things, like his name isn't Ritzik and that Rupert was born in Hungary! Bilko is accidently called to explain his earnings to tax investigators through an administrative error. Bilko thinks he is under attack for his rackets and protests so much that the tax department decide to search further into Bilko's 'charities' for his men and he has to prove that he made no profit from them. The platoon want to know from Ernie why there was $400 in their treasury but now there is only $300. Bilko tells them he lost it on a horse. Then Ernie has a brainwave he says he is going to pay all the cash back with the money he generates from breeding mink. But no matter what he does the two minks, named Mr and Mrs Kavanagh, won't get close to each other. Bilko cannot sleep because of his bad conscience. The Camp psychiatrist gives him some advice and Ernie listens and takes heed. He gives up gambling and he even gets up for reveille. He can now sleep soundly; the trouble is no one else can!! Biff, the son of CJ Bentonhurst, a Fort Baxter sergeant, is to marry a Philadelphia Main Line heiress, Penny Wingate. But her snooty family refuse to invite the boys father to the wedding because he is not a commissioned officer. Hopping mad, Bilko goes to Philadelphia to get the sergeant begged to attend the wedding. Rupert Ritzik goes AWOL in the middle of the night. He's sneaked off to Las Vegas after Bilko taunted him about being a bad gambler. He bets on double zero on the roulette wheel and wins $1750. All that next night and day Bilko and his fellow Sergeants, Grover and Birch, cover for Ritzik around the post. When he returns with his winnings the colonel finds out and locks him in the guardhouse to protect the money. So the other sergeants try there hardest to get in there with him. Trivia: Sergeant Rupert Ritzik says ‘I knew it, I knew it’ for the first time in this show. Ernie phones Everett Crosby to tell him that his client, Bing Crosby, has been voted by the camp as the 'singing discovery of the year.' Bilko asks him when Bing will be at the camp to accept the award in person. He's told that Bing will divert to the camp via his trip to Topeka. Ernie collects $560 for the concert but he's then told that Bing isn’t coming after all. So he's stuck unless he finds a replacement Bing!! Trivia: Playing themselves in this show is Bing Crosby and Everett Crosby. The mayor of Roseville won't build a deluxe servicemen's centre for Bilko. So Ernie masterminds a campaign to get Doberman elected to the office of mayor. With slogans like 'Insane about Duane' he wipes the floor with the opposition - that is until Doberman addresses his people in person. When the TV network decides that funny man Buddy Bickford is losing his comic appeal they send him and two writers to Fort Baxter to research background for a new army comedy show. Bilko sees it as an opportunity to make a load of money and tries to sell Bickford a series called 'Andrew Armstrong - Tree Surgeon', having primed the rest of his platoon to crack-up with laughter at the mention of any kind of wood. The Pentagon has a problem - they cannot find a suitable camp for their newly drafted GI, Elvin Pelvin. The problem is he's a famous Rock'n'Roll star and wherever he goes screaming girls find him. The top brass decide to send him to a quiet camp, Fort Baxter, not reckoning on a certain Sergeant Ernest G Bilko. Trivia: Private 'Sugie' Sugarman referred to as 'Thompson' in this show. Since 1942 Private Lester Mendelsohn has been marooned on a Pacific Island living on nothing but coconuts and fish. He's now a member of Bilko's platoon and he receives back pay totalling $7456.38. Bilko can't wait to get his hands on him after Lester returns from collecting the money. On the way back to the barracks Lester bumps into Ritzik and Grover and they clean him out at poker in 5 minutes. Ernie vows revenge and spreads a story around that Lester is into voodoo and that the God Goombar curses anyone who takes advantage of Lester. The camp is in the grips of a cold snap, minus 18 degrees to be precise. Bilko catches 'Florida' fever but the MO doesn't fall for his story. He decides he'll get to Florida via the army singing contests finals that are being held in Miami. Bilko has all contest forms sent to the motor pool, he keeps one and burns the rest. Then he gets every platoon member to sign the form, not realizing they are volunteering to be bitten by mosquitoes carrying the Caledonian Fungal fever. Bilko phones Mike Todd to suggest some publicity for his new film Around the World in Eighty Days: a $20,000 prize for the first person to go around the world in eighty hours. Ernie intends to get the money himself with the help of the US Air force. But at one airport change-over he inadvertently drops his ‘Priority Emergency Baggage’ tag on a 10-year-old boy. Ray Barker, an investigative reporter for the New York Globe newspaper comes to Fort Baxter to look for a story on GI's leaking defence secrets. Paparelli spots him and soon Bilko is selling him 'classified' plans, like 'Project Boom-Boom' - Ernie goes on to show Barker the "plans" of the sewage disposal system and diagrams of how Doberman's trousers are to be let out. When Bill Nieman announces the closure of the Roseville radio station, Bilko takes over the frequencies using the army Signal Corps equipment. Bilko gets local shopkeepers to advertise on his new station, WBBH. The programmes on the air include: Rupert Ritzik's 'Kitchen Magic', 'Lonesome Pierre', 'The Irish Tenor', and 'John's Original Wife' - which is actually the colonel and his wife being secretly recorded as a soap opera. A 'TANGERINE' rumour spreads throughout Fort Baxter that everybody is leaving to be shipped overseas and the camp left deserted. Ernie says it can only mean one thing 'that Fort Baxter is to be enlarged.' So he buys 25 acres of land, adjacent to the camp, known as Bimmelman's swamp. Then he tries selling off parts of it to the public under the name of 'Paradise Acres' a new town. Trivia: First appearance of Miss Wigman the Librarian. A professional hypnotist turns up at Fort Baxter. After watching him, Bilko sees a chance to get some money. He tries his own brand of hypnosis on Ritzik and tries to make him fall in love with Nell Hall, the colonel's wife. Rupert laughs at Ernie's attempts but unbeknown to everyone one person has succumbed - Duane Doberman. Ernie plans to get Colonel Hall into a big golf tournament in Palm Springs, but first he must convince him that he is good enough. He gets his old army buddy, Sam Snead, to hit the ball when the colonel shuts his eyes and swings on the tee. Bilko magnetises all of the golf green cups too. And the colonel goes around in a record score!! Trivia: Playing himself in this episode is Sam Snead. Members of the cast meet in Lindy's restaurant on Broadway for a light lunch before rehearsal. Ed Sullivan meets them there and together they watch scenes that have been "supposedly" cut from past shows. Scenes include; Ernie auditioning for The Ed Sullivan Show, Ritzik & Grover trying to win a bet from Ernie, Ernie showing the platoon a picture of the gorgeous Seymour Lamour. Trivia: Playing himself in this episode is Ed Sullivan. Doberman starts dating Lillian Middleton, the daughter of the President of Consolidated Iron and Steel, a millionaire businessman. But he is thrown out of the Middleton house when Lillian’s mother discovers he is just a soldier. Bilko is enraged at the insult and convinces everyone that Duane is in fact His Highness Crown Prince Doberman friend to Princess Grace and Edward and Wallis! !